poverty and hatred has been eliminated and all of humanity is equal. A superficial look at the possible hidden aspects of Star Trek won’t get you very far. 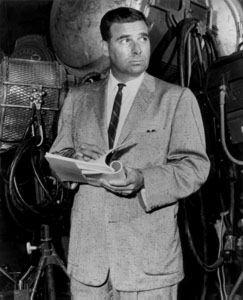 Many of the knee jerk reactions consider that the ‘proof’ can be found in relation to various religious agendas (Star Trek creator Gene Roddenberry’s Baptist upbringing in relation to the TV industry in the 1960s) although (in reality) there is very little evidence to substantiate these claims. 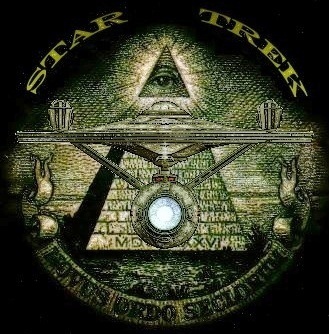 This doesn’t mean that the idea of a Star Trek ‘agenda’ is unfounded though. In order to get an idea of a possibly larger picture, one needs to play a game of ‘degrees of separation’. Some may say that doing this only shows a bunch of coincidences, but I encourage any open minded person to look at these factors carefully before drawing conclusions. The first place to start is with Gene Roddenberry. Was he a Freemason?! Many speculate (and even state) that he was a 33rd degree of the Scottish rite, although there appears to be no obvious evidence in this case. 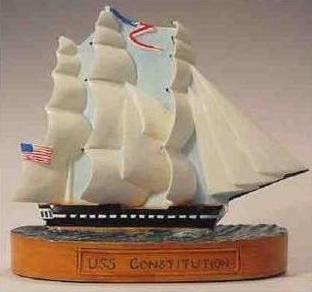 “Enterprise”, the ship remained a “constitution class starship”. 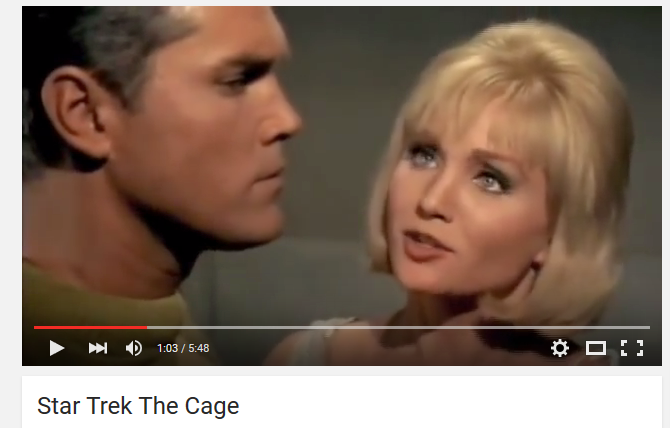 The Star Trek The Original Series 2-part episode, The Menagerie, was reworked fom the show’s actual 1965 pilot epsiode named The Cage. The Menagerie was aired in November of 1966. A group of small telepathic aliens very reminiscent of the little grey aliens that dominate today’s commercial market, hold Captain Pike a prisoner. The Star trek series, of course, went on to be a huge success. Star Trek Voyager – In the Star Trek Voyager episode Coda, Captain Janeway is almost fooled by an alien into thinking she has died. The alien poses as her father, imploring her to follow him into the light. She is suspicious of his intentions and refuses. JANEWAY: That’s the real me, isn’t it, lying on the ground on that planet, dying, and this is the hallucination. This isn’t real. ALIEN: More denial. You’re only making it harder on yourself. JANEWAY: You’re trying very hard to convince me to come with you. Why is that? If what you’re saying is true, why not let me come to the decision on my own? ALIEN: I’m trying to spare you unnecessary pain. 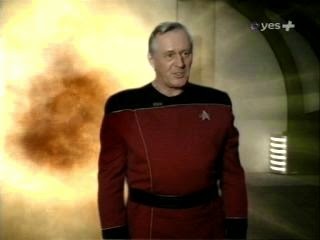 JANEWAY: My father would never act like this. He always believed I had to learn my own lessons, make my own mistakes. He never tried to shield me from life. Why would he try to shield me from death? You’re not my father. I could be imagining you, but I don’t think so. You have such a specific agenda. You’re determined that I go with you somewhere. Who are you? ALIEN: I’m trying to help you. Stop fighting me. JANEWAY: Are you an alien being of some kind? Is that it? CHAKOTAY: Her eyes are open. EMH: Vital signs are responding. Blood pressure is sixty over thirty. TUVOK: But the entity is still inhabiting her cerebral cortex, impeding your treatment. CHAKOTAY: Kathryn, hang on. We’re bringing you back. Just fight a little longer. EMH: Direct synaptic stimulation might drive out the alien presence. JANEWAY: I was right. I heard Tuvok and Chakotay and the Doctor. You’re an alien. You’ve created all these hallucinations, haven’t you? ALIEN: This is what my species does. At the moment just before death one of us comes down to help you understand what’s happening, to make the crossing over an occasion of joy. JANEWAY: And what is that? ALIEN: Our Matrix, where your consciousness will live. I was being truthful when I said it was a place of wonder. It can be whatever you want it to be. JANEWAY: Then why didn’t you tell me this from the beginning? Why pretend to be my father. ALIEN: Usually people are comforted to see their loved ones. It makes the crossing over a much less fearful occasion. I’ve done this many times, but I’ve never encountered someone so resistant. EMH: Something’s happened. The alien presence is getting stronger again. CHAKOTAY: Fight it, Kathryn, just a little longer. EMH: I’ll have to try a thoron pulse. JANEWAY: My people are telling me to fight. They’re trying to save me. ALIEN: They’re trying out of desperation. It’s hopeless. JANEWAY: You’re the one who sounds desperate. I don’t get the feeling you’re trying to make me comfortable. You’re only interested in my agreeing to come with you. JANEWAY: And you don’t strike me as any type of Good Samaritan. You’re more like a vulture, preying on people at the moment of their death when they’re at their most vulnerable. ALIEN: I’ve waited for you. I’ve been patient. JANEWAY: But your patience is wearing thin. What’s the real reason you want me in that Matrix? Somehow I don’t think it has anything to do with everlasting joy. ALIEN: You must go with me. JANEWAY: If you could force me to go, you’d have done it already. You need me to agree, don’t you? I have to go voluntarily. ALIEN: Wouldn’t that be better than standing here in this endless debate? JANEWAY: Let me tell you this. We can stand here for all eternity and I will never choose to go with you. ALIEN: You’re in a dangerous profession, Captain. You face death everyday. There’ll be another time and I’ll be waiting. Eventually you’ll come into my Matrix and you will nourish me for a long, long, time. Afterwards, Captain Janeway discusses the encounter with one of her crew. CHAKOTAY: I can understand that. I can’t help thinking about it. That alien, his Matrix, he was like the spider that has to lure a fly into his web. JANEWAY: Do you think it’s possible that each of the near death experiences we’ve heard about are the result of an alien inhabitation? Commentary: Is There A Hidden Psychosis Behind Police Brutality?